Hello! 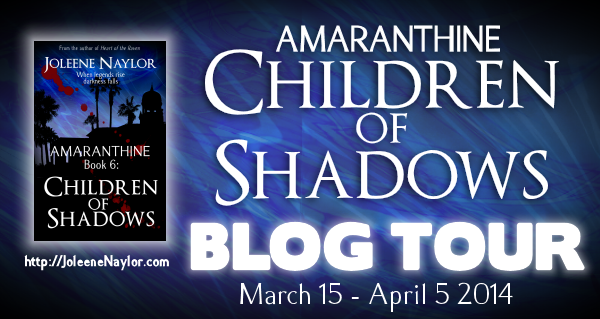 Joleene Naylor here, the author of Children of Shadows, book six in the Amaranthine series. First I’d like to thank Barb for letting us hang out on her blog today. Hopefully we don’t make a mess. See? It has excitement written all over it. Jorick: The only thing I’m excited about is the potential break between books. Jo: Why? Thanks to my real life problems, you already got an extra five months between the last book and Children of Shadows. Jorick: And you made up for it by torturing us, didn’t you? Jo: I don’t think so. If anything I was too soft on you in the new book. Jo: Hey, hey! You wanna give away the whole book? Geeze. Quit complaining. At least I didn’t kill you. Jorick: You can’t. The fangirls would riot. Jorick: I don’t want to have this conversation. Jo: All right then, back to the book. Would you like to tell our readers what it’s about? Jorick: It’s the sixth book in the series, wherein our horrible author finds new and creative ways to make us sorry she ever learned to string two sentences together. Not that she does that effectively, mind you. Jorick: It starts on a lovely beach, but our author can’t leave us there. No. She makes Wolfe, the minion of Munich, demand we go back to the vampire stronghold in Germany and testify about what happened in the cave at the end of the last torturous book. That’s when an extinct vampire cult resurfaces and decides to try to destroy half the world, which leaves us in a precarious position for a lot of reasons. The only semi-good thing is that someone shows up who claims to know that idiot, Verchiel, and he’s in a tight spot for several chapters. Jo: You really dislike him. Why? Jorick: He’s arrogant. He’s obnoxious. He doesn’t take anything seriously. Jo: And you can’t read his mind so you have no idea what in the hell he’s up to. Jorick: I don’t need to read his mind to know what he’s up to. He’s always trying to get Katelina alone. Jo: You’re really suspicious, huh? Jorick: Of course I am! Especially with you as an author! Jo: Well I can promise that at the end of children of Shadows she’s most certainly not alone with Verchiel. Jorick: Oh, ha, ha. I know where she is, thank you very much. What I’d like is a guarantee on the next five hundred books. Or you could just let me kill Verchiel. Jo: I could but…no. Not happening, slappy. If I let anyone kill him it would be – whoops. Never mind. Jorick: What? Are you considering it? Jo: I think that’s about all the time we have. Thanks to my surly vampire hero Jorick for taking the time to talk to me, to Barb for hosting us, and to you, the reader, for reading. Be sure to check out the giveaway link and enter for a chance to win some awesome prizes. 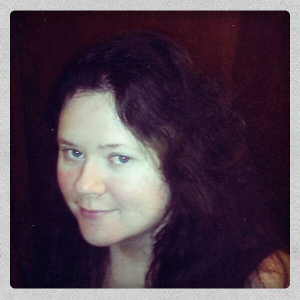 Joleene Naylor is the author of Amaranthine, a paranormal series where vampires live in the shadows and don’t sparkle. In her spare time she is a freelance artist, book cover designer and photographer. You can find information on all of her pursuits at her website http://JoleeneNaylor.com . She also maintains blogs full of odd ramblings and hopes to win the lottery. Until she does, she and her husband live near Bolivar Missouri with their miniature zoo and a couch coated in cat fur. The Children of Shadows, a vampire cult not seen for hundreds of years, resurfaces to wage war on the vampire guilds. Led by a familiar face, the cult wreaks havoc while Katelina and Jorick are trapped in Munich. Ume, a mysterious vampiress, claims to know Verchiel and offers the help of her secret organization. But can they trust her? As mysteries are solved, new ones appear. Why have the Children of Shadows returned, and is it really a former ally that leads them, or a look-alike? 1st prize: Amaranthine t-shirt (size is winner’s choice), set of bookmarks, and $20 gift card for Barnes and Noble or Amazon (winner’s choice). It would be a revolt. Lol! Nice, Joleene! This is a really good idea! One of these days Verchiel will put a smile on Jorick’s face. Hey! You mean you, the author, have thought of killing him too? Ok, so he’s a bit irritating at times. Oh, off the subject again. Wonderful interview. You know Jorick secretly loves this series. He is the hero afterall (said to take Jorick’s mind off of killing Verchiel).